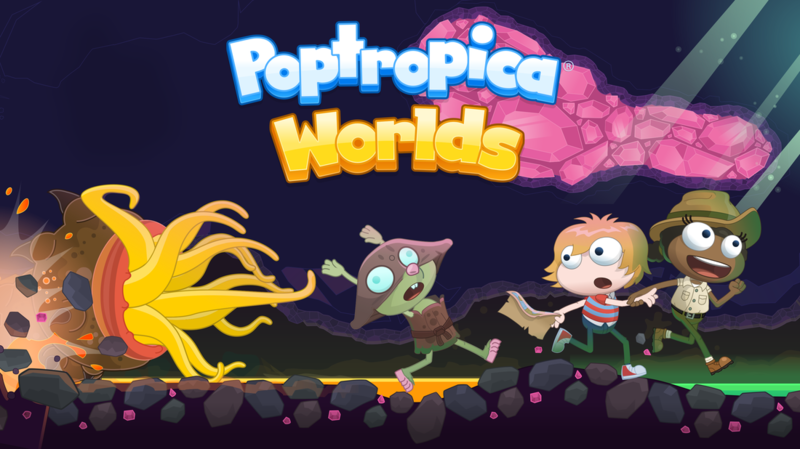 In this adventure, you must stop a deadly supervolcano that threatens Poptropica! Dive deep into the earth and explore areas (and maybe even civilizations) that have yet to be discovered. What challenges will you face? 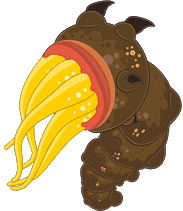 This is the first Island released on Poptropica Worlds and also functions as an introduction to Worlds. Whoa, what an earthquake! This island doesn't give you any time to catch your breath, does it? The premise: Caldera State Park (which is modeled after Yellowstone) is on top of a massive supervolcano, which might go off at any moment! Our job is to figure out why and stop it. OK, so here's the plan: the Visitor Center is missing a pair of elk antlers, which we have to find and return to them. Go all the way left, to the next scene (Crispin Cave). Quickly drop down and land on one of the white platforms, and move your mouse to a point above and a little to the left of your player. When the jet of water comes, it'll launch your platform up and you'll be flung in the direction you pointed to, so hopefully you should land on top of the next big rock with an arrow on it. Repeat this twice more until you reach the steps to the far left, then climb up. Finally, enter the cave. There's the elk antlers, ready for a-taking! Go right and grab them, then exit the cave and walk all the way back to where the island started. Keep going right from there and enter the Visitor Center. Run all the way to the left and climb the stairs, then run all the way to the right and jump up the platform there to get to the top floor. Then walk left, past the fireplace, and there's the elk -- except its missing some antlers. Get close to the park ranger standing next to the sign, then USE the elk antlers you found (click on Items in the bottom right, click the antlers, then click USE). He'll be so grateful that he'll make you a junior ranger for the day! Now leave the Visitor Center and go all the way to the right, to the next scene (Old Reliable (yes that's a pun on Old Faithful)). Walk up close to the two scientists there and USE the junior ranger badge. They'll give you a magnetic belt and task you with restarting a measurement device they have placed underground. Alright, time for the action to begin -- run all the way back to the cave. Go down to the bottom right, where two elderly visitors are trapped by a strange-looking gray stone cube. Now that you have the magnetic belt, you can click and drag the cube to move it away until it drops into the hole to its left, freeing the two of them! Next, go all the way to the left of the cave and jump up the ledges until you see a clump of magnetic rocks above you. Click on it, and it will start emitting a magnetic field (white circles), then jump towards it; it will pull you up. Get a running start, then jump to the right so you land on the ledge to the far right. Walk past the tent and go right, to the next scene. It's an underground maze! Go right until you see a pit in the ground. Pull the next gray magnetic block towards you until it falls in, then continue on. When you get to the stack of three blocks, pull them out one at a time from the bottom, then continue past (you don't necessarily have to drop them all into the corresponding pits). Drop down and walk left, where there are two more blocks and two more pits; you know what to do. Keep going left until you get to a ledge; now here comes something more tricky. Go left slightly and drop down to the lowest platform (but not actually in the water). Jump up and to the left; you will see a clump of magnetic rocks stuck to the ceiling. Click on it while in midair, then swing your mouse to the left. It will pull you up and fling you past the puddle and over to the other side! Drop down and run to the right until you get to a spout of hot water. Easy as pie -- just drag down the gray block from the ledge to the top left and push it so it covers the spout. Then continue on to the right (you can ignore the next gray block on the high ledge) and simply jump out of the water. Go right until you see some ropes hanging down. Sadly, they are not climbable; you will have to use your magnetic powers, and this part can get kind of tricky. Get on the highest platform under the rope, then jump up and click on the clump of rocks above you and to the left. It will pull you onto the next platform. Jump up and to the right, then quickly swing your mouse to the left to land on the grassy platform above. Click on the clump of magnetic rock to the top right and jump towards it. Jump up to the platform above like you did before, then drop down to the right. The camera will dramatically zoom out, revealing the chamber ahead of you. Walk to the far right end of the ledge you're on, then click the magnetic rock above you and jump to the right. The force will pull you up just enough that you land on the hanging platform. Jump off and to the right. Now go a little bit right, and pull that magnetic cube back and off the platform. It should fall and land on the low platform. Push it all the way to the right, then climb up on it and jump to the right. There's the scientific equipment we're looking for! Try clicking on it, and the drill. Whoops! There's another earthquake, the ground falls away, and you tumble down the rabbit hole!